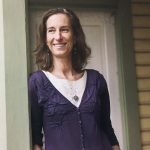 Meet Wooldridge Elementary librarian Elizabeth Mikeska-Benfield, her husband Patrick, the STEAM and Maker Space coordinator at St. Gabriel’s Catholic School (PreK-8), and their two sons, Memphis (10) and Jackson (8). I met the family when we gathered for a Capitol protest to restore public school funding in Texas. 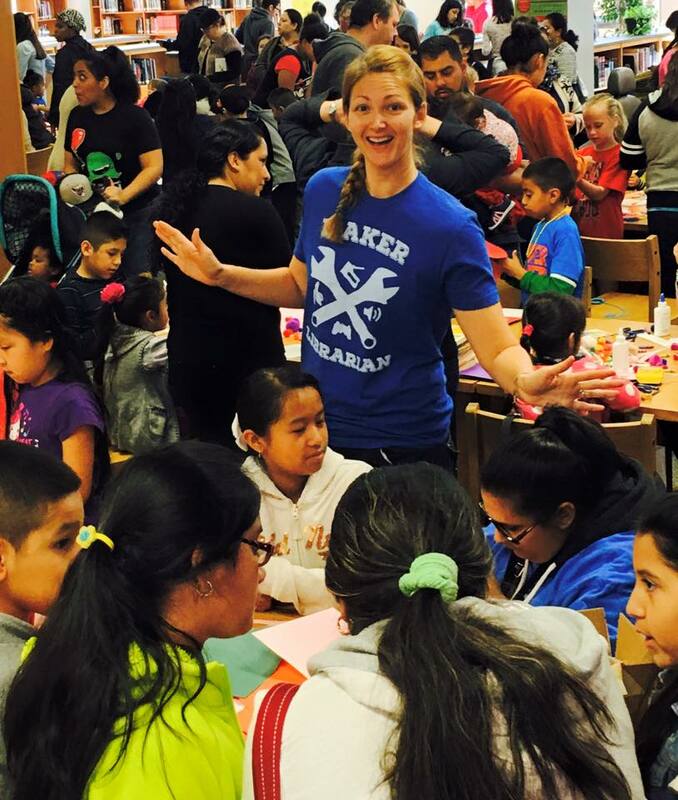 Sara: How did you discover the Maker Space movement, and why did you decide to get involved? Elizabeth: I first became aware of the maker movement about six years ago. My husband would go on and on about it—but, at that time I thought it was just a high-tech movement. I thought to myself—I’m not a techie, this isn’t for me—and I kind of dismissed it. It wasn’t until I attended the Austin Mini Maker Faire that I truly understood what this movement is about. I saw artists, musicians, poets, Lego sculptures, and all sorts of amazing creations. It was then that it clicked that I am also a Maker—it was the creative/artsy/crafty side of the movement that initially drew me in, but then opened me up to what the movement is actually about—letting kids (or grown-ups!) learn through self-navigating and problem-solving. Patrick: In 2013, I discovered the Maker Movement after stumbling upon a YouTube video of a speech by Adam Savage, of MythBusters fame, called “Why We Make,” and it really captivated me. In it, he described the joy and frustration that’s all part of the act of creation. He also connected this process with the idea of STEAM, which mixes elements of science, technology, art, and math in creative and unexpected ways. While watching this, I had an epiphany — all of it suddenly began to reassemble in my mind and fit together – it finally all made sense! My teaching practice was never the same after that. Sara: Do you think it’s better for librarians to be Maker Space facilitators or to have the position separate? Elizabeth: I think that the library is a very natural place for a Maker Space. The library is a place where people come to learn new things and find helpful resources, so it makes sense that a Maker Space, where students can come explore, create, and problem solve, would be centered in a library. Sara: How do you offer Maker Space opportunities for your students at Wooldridge, a Title I school, in the face of budget restraints in our district? Elizabeth: The Maker movement is more about a state of mind than fancy materials and 3D printers—although those things are great—they don’t make a Maker Space any better than one with only cardboard and hot glue guns. So, with that in mind—I’ve been able to start a Maker Space with lots of donated items and the mindset that it’s not about the stuff. It’s about providing a space for students to learn from their failures and experience successes by problem solving—whether that is with creating a tower out of cardboard or spaghetti and clay—or, creating code for a 3D printer. How about making a car? I get as many donations as I can, and I do use some of my book fair profits for materials. 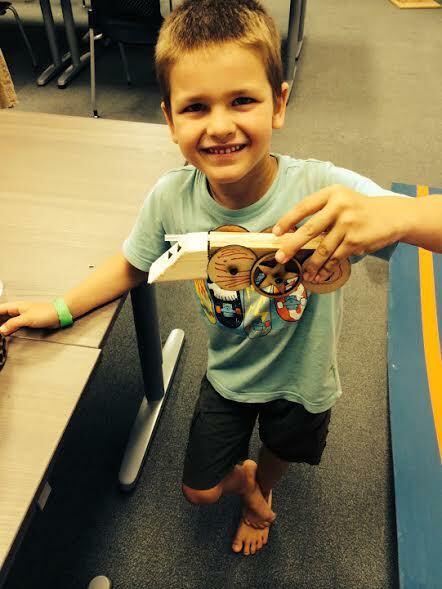 Sara: What advice do you have for librarians who may be reluctant to embark on the Maker Space train? Elizabeth: I would say—this is what learning should be—what it used to be! I think a lot of librarians have an idea that having a Maker Space is a lot of extra work—and, that it’s messy. Some of that is true—but, it is SO worth it. The great thing about having a Maker space in your library is that you can create the program/space that fits your abilities and the needs of your students. Starting with what you know is key—if you aren’t comfortable with coding—don’t jump into that first thing. I’ve slowly opened up to the more high-tech areas of making—but, I started with recycled materials and hot glue! 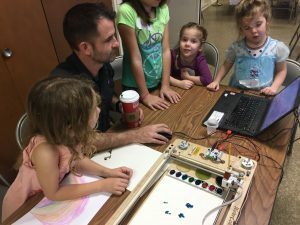 Sara: What’s it like to live in a Maker family? 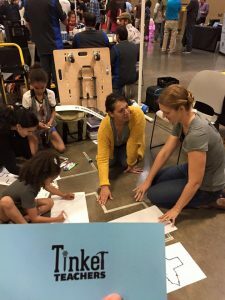 Sara: Tell us about your new venture: Tinker Teachers! Elizabeth: I’ve started a literacy-inspired, Maker Space summer camp business with one of my friends/colleagues, Cynthia Ayala, a Special Ed. teacher at Ridgetop Elementary. 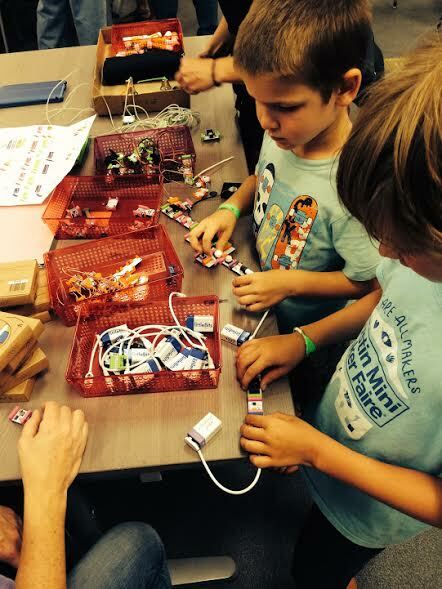 It’s called Tinker Teachers; we had our first successful round of camps this past summer. Our Maker Camp is unique to our area because we are the only ones who are connecting literacy to making–it just makes so much sense to us! We are already gearing up for next summer! Check out our website: http://www.tinkerteachers.com/. Maker Spaces have become a big part of all our lives. It’s definitely a family affair–we couldn’t do it without all their help. 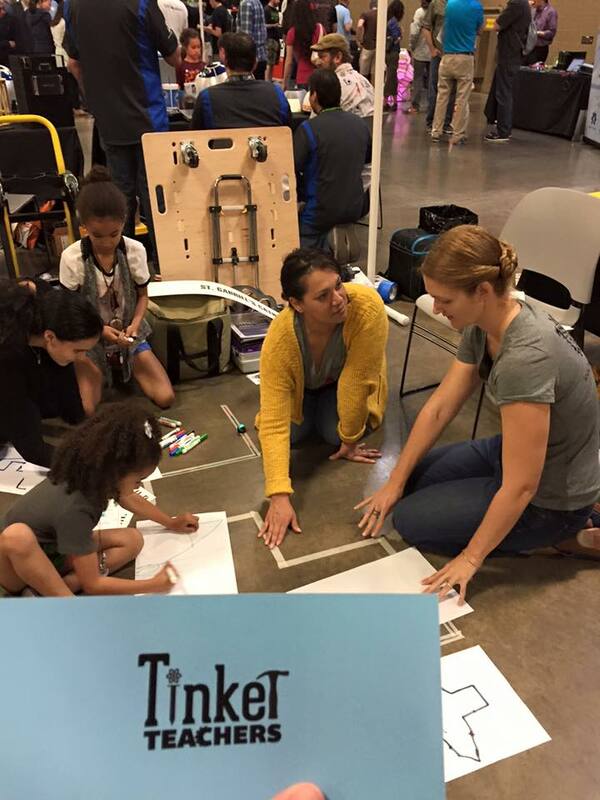 Our goal is to have our own space one day and to take the leap to run Tinker Teachers full time.